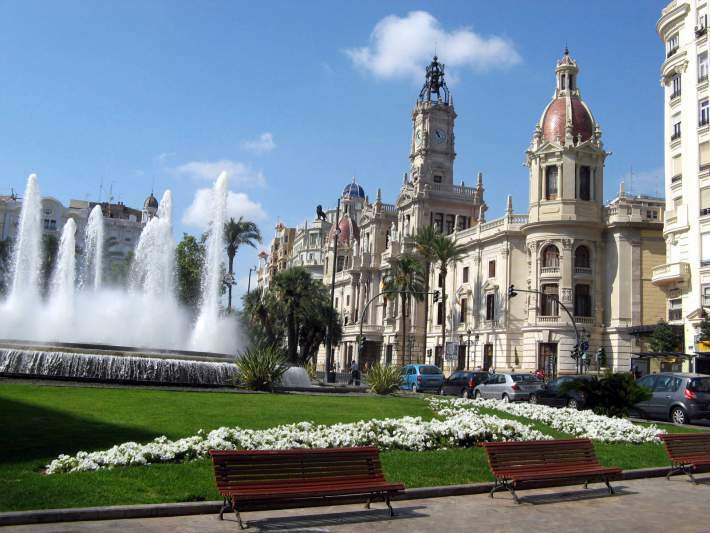 From foodies to museum goers, Valencia has something to offer for everyone! Make sure you stop by Valencia’s Cathedral, a stunning Gothic masterpiece that contains what most historians agree to be the true Holy Grail that Christ drank from at his Last Supper! Another must see is the Museo de Bellas Artes, one of the best collections that Spain has to offer. This small museum contains pieces from iconic Spanish artists like Goya, Velazquez, and El Greco (and it’s free!). Check out the Ciudad de las Artes y las Ciencias, which is one of the 12 Treasures of Spain, and a perfect example of Valencia’s harmonious coexistence of the ancient and the modern. This construction is gorgeous and inside you can explore the science museum and all of its exhibits! Now let’s get down to everyone’s favorite topic: food! 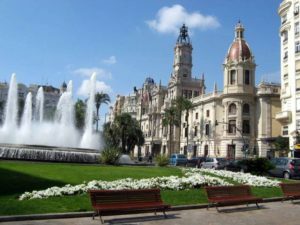 Valencia is home to the paella, a delectable simmered dish of rice with seafood or meat (most commonly chicken or rabbit in Valencia). If football is religion in Europe, then Real Madrid is the Vatican! Anyone who is in Madrid during a match will quickly learn that the entire city comes to a complete stand still for 90 minutes. Everyone either gathers in their homes, local bars, or makes their pilgrimage to the Santiago Bernabeu (Real Madrid’s Stadium). Football fans also know that Champions League football is special as it is the competition that brings the best football clubs throughout Europe into one tournament. On this faithful night Real Madrid was playing Sporting Lisbon (the champions of the Portuguese League last season), in their opening match of the Champions League. As we got onto the metro to the stadium we were greeted by thousands of other supporters chanting Real Madrid’s famous chant “Hala Madrid”. Once we finally got to the stadium we spent about 30 minutes just getting into the stadium so I would highly recommend anyone going leave at least two hours before the match to guarantee you do not miss anything. Additionally, Champions League tickets are a little harder to find then a regular season game, because everyone wants them. That is why we paid a little extra (around 100 Euros) to get tickets through a company who purchases a lot of tickets from the club directly as soon as they go on sale to the public so that we were assured to get valid tickets. Walking up the stairs to our seats had my heart pumping a hundred miles per hour. The inside of the stadium was beautiful! There is not a single bad seat in the entire stadium. We got to our seats about 45 minutes before the game, but we were entertained by the players warming up and all the prematch rituals that only happen for Champions League games. (Again another reason I highly recommend going to a Champions League match.) In addition, was the starting line announcements with the likes of Christiano Ronaldo, Garreth Bale, and Sergio Ramos, the greatest players in the world! When the match finally started it was incredible! The first half saw Real Madrid stringing passes together all over the pitch only to just finally just miss the crucial pass right at the end. While Sporting was playing a counterattacking kind of game, where they would defend deep until they could regain possession and then would quickly break on the Real Madrid defense. Sporting actually came the closest in the first half as they hit the crossbar right before halftime. The half finished 0-0, but both teams looked like they had goals in them. The second half was when the goals finally came flying in. Sporting scored first, within 5 minutes into the second half with Real Madrid’s defense made a crucial mistake and the ball fell to Sportings striker, who scored with a very simple shot put Sporting up 1-0. Real Madrid kept pushing for an equalizer, but just could not get the ball in the back of the net. That was until the dying minutes of the game. With 5 minutes left in the match Real Madrid won a free-kick just outside the box. Ronaldo with his trademark free-kick rocketed the shot over the wall and into the top corner to tie the game at one apiece. The stadium went absolutely mad! For a good portion of the game it looked as if Real was going to lose, and then the best player in the world showed his world class! The match was not finished there however. With 4 minutes of added time Real was not looking to just get a draw, they wanted to win, and they pushed everyone into the attack. With 10 seconds left in the match Real Madrid’s winger whips in a cross from out wide and up rose Morata (Real Madrid’s substitute striker) and headed in the winner! Literally the last touch of the ball was the winner. The stadium erupted as everyone in the stands (including us) completely lost our minds and were going crazy. 2-1 Real Madrid, Champions League night at the Santiago Bernabeu! The type of thing football fans dream of and we got to experience it!